To Life! 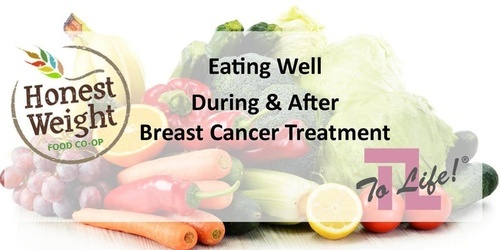 and Honest Weight Food Co-op have teamed up to offer a special cooking class designed for patients and survivors of breast cancer and those who care for them. Join Raya Ioffe, Functional Nutritionist & Lifestyle Practitioner, as she demonstrates simple, nourishing recipes for clean comfort food to support wellness during and after treatment. Space is limited. Please call To Life! or visit Eventbrite link to register. Free-of-charge but advance registration required. Click HERE.